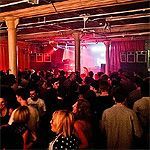 The Bussey building aka The CLF Art Cafe and The Bussey Warehouse holds a diverse range of events including club nights. 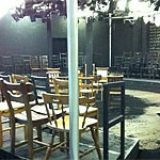 Do you work at The Bussey Building? 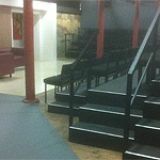 What did you think of The Bussey Building? 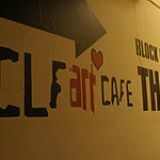 Situated alongside an abundance of hair salons and imported food stores on Rye Lane is the unassuming entrance to the Bussey Building aka The CLF Art Cafe; a thriving multi-floor and multi-purpose arts venue where you’re just as able to see an obscure theatre show as an internationally acclaimed DJ. After walking along the long, not-so-dark tunnel you’re faced with a huge concrete complex connected by a main stairwell. A couple of floors up is the ‘warehouse’ space. In this large open room, punctuated by a few columns, club nights take place with 1000 or so people able to dance under the open pipework. Some sofas are also at hand too. Arguably, the Bussey Building’s most eye-pleasing feature is its courtyard. One of London’s more relaxed smoking areas, the outdoor walls are adorned by huge mural-like graffiti by Sheffield-based artist, Phlegm. Similar to ROA' s street art (such as his ‘Hackney rabbit’), Phelgm’s distinct imagery elevates the venue beyond its surroundings and helps create the artsy vibe. Music events tend to have a good (read balanced) gender ratio with a nicely diverse crowd able to generate a positive vibe; friendly without being overly so. Bass gets the windows rattling and although coloured curtains keep this out of sight, if you’re close by, The Bussey Building’s certainly not out of earshot. Think of a musical style and it will probably feature from time to time, such is the eclectic programming. Some residencies offer soul, funk, or jazz on a regular basis, others play more disco, house, and techno. The sound quality in the club space is not always up to scratch. However, certain regular promoters manage to get it right. Attentive staff in a busy and usually well run bar serve drinks at prices cheaper than many London venues. Cash only (head to the station for the nearest cash points), a glass of wine is £3.50 (and up), a bottle of the house plonk, £13. Beers are £4 while juices and most fizzes are £2 a pop. The bar fridges also stock appetising cakes and other sweet treats. 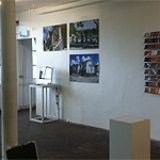 A safe bet for an enjoyable club night out and, whether referred to as The CLF Art Café, the Bussey Building or the Bussey Warehouse, a key venue in the continuing rise of Peckham’s evening into night happenings - see Bar Story, Frank’s and numerous pop-up or less legit warehouses for further reference.